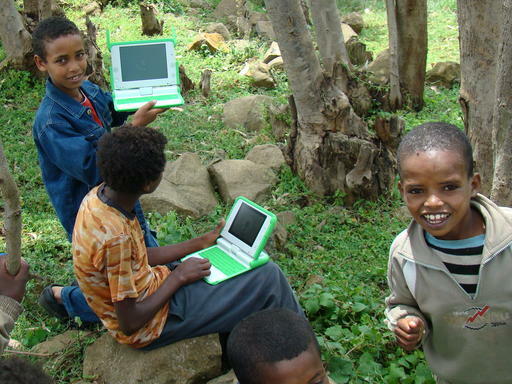 This week, I joined the OLPC Ethiopia team on their travels to a rural school in the Oromia region. The 2 hour drive was fascinating. You start off driving through typical Addis city areas, but slowly there are more and more animals on the road. People are jogging behind their donkeys, which are being used to transport wood and other materials. The landscape improves. After more and more animal-dodging, we reach a town with some basic shops, and the road becomes a dirt track. Oh good, we’ve arrived. 30 minutes later, we veer off road and start driving up a grassy bank. We stop at a gap in a fence. Welcome to Mulosayoo school. The school is made up of a number of disconnected buildings, each one holding one or two classrooms. The playground/assembly area is just some grass. Cows are calmly wandering around (unfortunately we did not budget any laptops for them though). The children are fascinated by my presence, seemingly having never seen a white person before. One of the first things that strikes me about the classrooms is that they do not even have lights! The teachers are excited but having little experience with computers, they are challenged by the training. Perhaps one of the most encouraging stories from the training days came from a daughter of one of the teachers. The teachers had been in possession of the laptops for a while beforehand, and this young girl had spent some time with it. She eagerly explained how she had learned to write, paint, and take photos, without any introduction or training whatsoever. There was much excitement as laptops were distributed. My favourite moment of the experience was driving back on the 3rd day. Shortly after leaving we drove past children walking home with their laptops. We then reached a scene where there was a rural-looking man on horseback, dressed in simple, rag-like clothing. Remember, we’re totally in the middle of nowhere. 3 children were following on foot, holding their high-tech XO laptops. This was easily the biggest mix of generations, lifestyle and technology that I have ever seen in a single scene. No photo, unfortunately, so it will just remain as a memory. More pics on the OLPC photostream. This entry was posted on Saturday, September 27th, 2008 at 4:07 pm	and is filed under Gentoo, OLPC. You can follow any responses to this entry through the RSS 2.0 feed. You can leave a response, or trackback from your own site. May the God of Ethiopia bless your work! Keep up the good work, and the amazing stories that go with it! Teach always the positive.You should continue to be exemplinary. Dedication and commitment is mandatory for such a benevolent action.Some times you might face a chalelnge but donot be tenacious!!! This is an onus vested on you and others to shape the generation. Doing such good things primarily give satisfaction to the doer of the action. thus I encourage you to do so. Oh!!!!!!! !what a blessing action it is !!!!!! It is not surprising because you are paying what your forefathers have looted from Africa. I agree we have it too good sometimes. Always complaining and its articles like these that really show how well off we truly are. Thank you for sharing. Great presentation. I want to use it for the paper I’m writing for my World Contemporary Business class at Oakland University in Rochester, MI. “Each student should find news articles about a significant current event or business headline from your country (mine is Ethiopia). Bring your articles to class. You will present, for 2 – 3 minutes, your best or favorite news story with the class and explain the implications of this news to the people living in the country, the world at large and the global business environment. So I thought that business begins with an educated workforce and the earlier the start, the better. So now I want to know, how’s it going? Do we have any evaluations of the program so far in Ethiopia? I understand that the political situation is rather difficult, and the country is facing some difficult distractions from hostile neighbors, and the government may not be treating all the people fairly. How about an update for me? 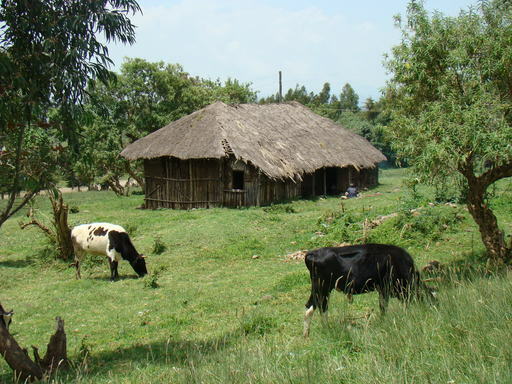 Dan, I returned in Jan 2011 from a Habitat for Humanity build in Debre Birhan, Ethiopia. I am now working with a local teacher in establishing a computer/ technology class. Do you know who he or I may contact in Ethiopia to assist him in doing this ?